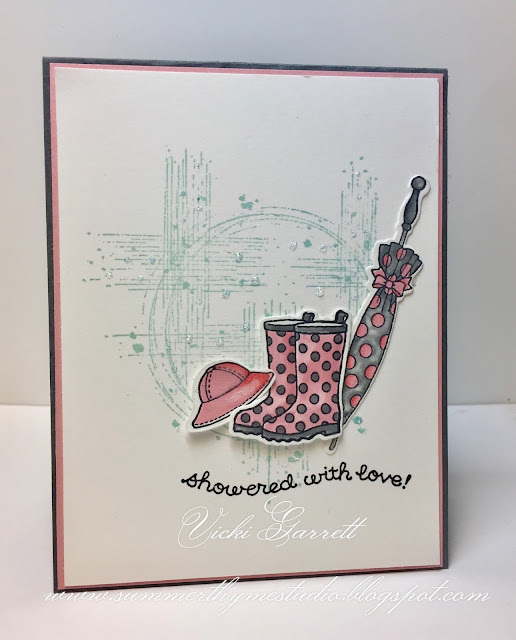 Today's Oldie but Goodie Wednesday at Technique Junkies Stamps. I LOVE this stamp. So much in fact, you've seen it three times in the last couple of weeks, in one form or another. The Boots, Umbrella and Rainboots are all one image, but it's fun to deconstruct it. 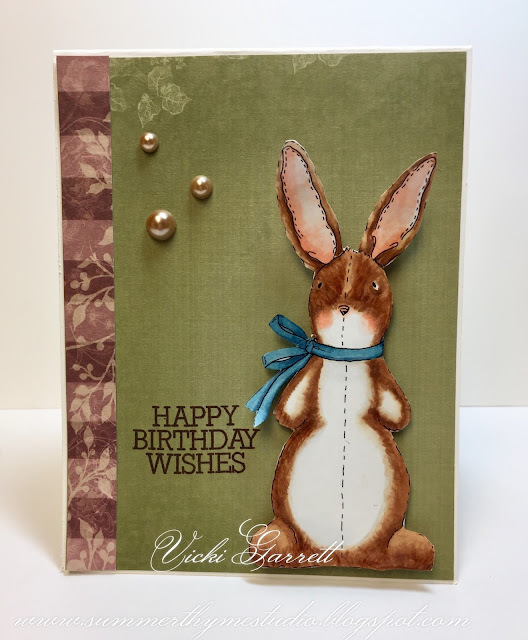 I used my MISTI and Markers to colour each part of the image and stamp them separately onto the card front. 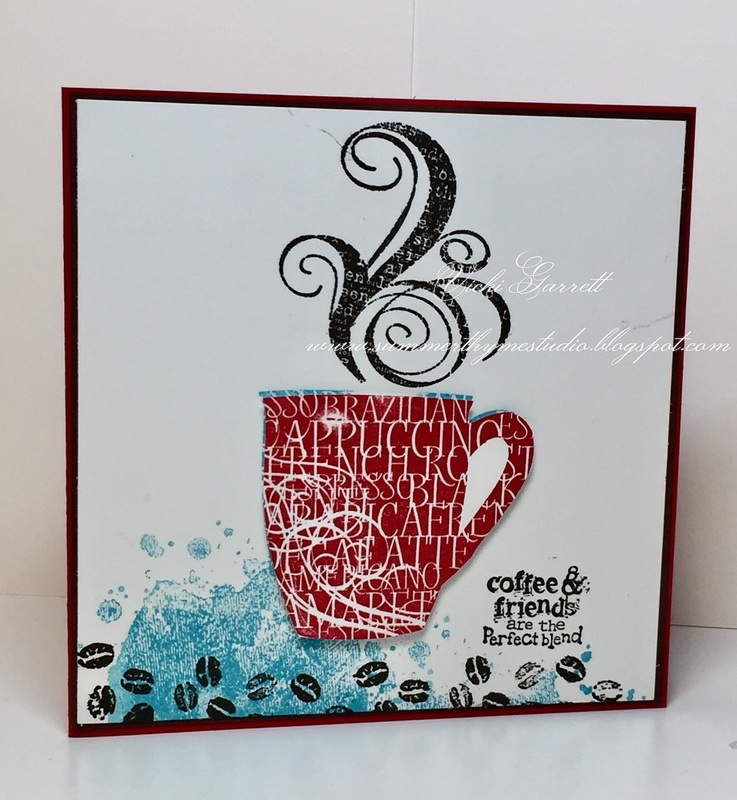 I used Pear Pizzazz, Bermuda Bay and Melon Mambo Ink along with my Versafine black. 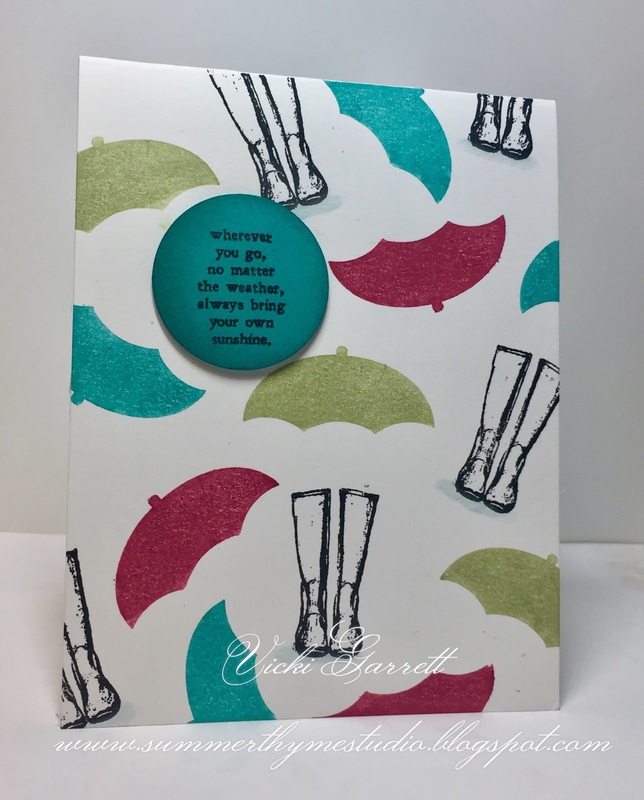 Finally, I used the marker to highlight the sentiment and stamped it on Bermuda Bay Cardstock. Make sure you check out the Technique Junkies FB group for more oldies but goodies! It's a drizzly and dreary day here today, so what better to do than don some cozy slippers and stamp! Smoky Slate, Pink and Soft Sky. I had yet to break out this sweet Showered with Love Stamp and Matching Die set from Impression Obsession. I coloured the with the Matching Stamp n Write Markers, so the shading isn't quite as smooth as with Copic, but I do like the effect. I wasn't quite sure about it, but I like it.....it kind of mimics rainy weather, cause if it were an asteroid belt whirling about your hear, you'd need more than an Umbrella, Wellies and a Hat to save yourself! lol. Ahhh my imagination getting away on me again!!!! So yeah, a little share for you today. I coloured the Cuddle Bunny Stamp with Copic Markers. The sentiment is from the More Basic Greeting Clear set. This is a great sentiment set and I use it quite often. I found this pretty Designer Paper called Hearts Ease from Couture Creation. Lastly, I added some pearls as I cased Kelli's design. You can see her card HERE. I ought to get off the computer now and get outside while the sun shines!! This week, we're having a cake eating contest....whooops, I mean a Cake challenge over at Impression Obsession Stamps! There is nothing better to look at and eat, than a pretty cake!! I kept my card simple this week and used one set to create my card. I coloured my image with Copic Markers. I added some white gel pen accents and of course some glitter for added pizzazle!!!! Every cake needs a little sparkle! Let's see your Cake Creations! One player will be selected for a $25.00 gift certificate! and of course, don't forget to check out the DT Creations! Today is Oldie's but goodies day at Technique Junkie Stamps! I have a coupon code if you'd like to shop! I sponged some pool party and old olive in to create the look of sky and grass. I stamps the Flamingo in Flamingo Ink and added in the dark elements with a marker. The Flamingo Stamp is one stamp with the sentiment, thus the handiness of the Misti which you can also purchase HERE in the TJ store. Lastly, I added a few flowers just for good measure! 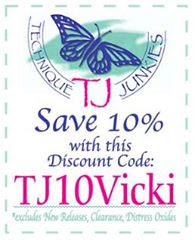 Here's a coupon code just for you! I up WAYYYYYYY early this morning. That isn't such a bad thing as I will be back to work in two weeks, so I better get myself into an earlier morning routine! 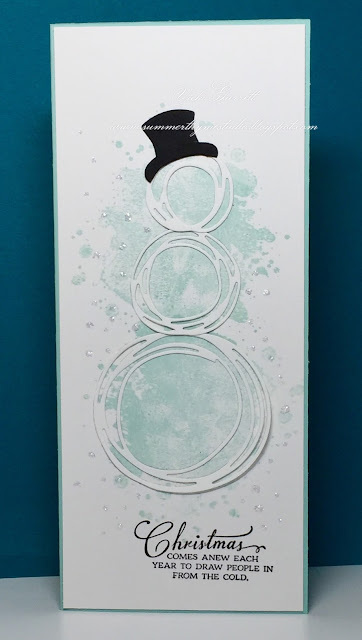 I crafted this card for yesterday's Clean and Simple challenge over at Splitcoaststampers. The challenge was "raise up". I mounted both the main image and the umbrella on dimensional tape to meet the challenge, as well as adding the flowers to coordinate with the paper piecing on the umbrella and the band of paper. What ABOUT this paper? Delicious!!!! It is from the Rose Quartz collection from Prima! Stay tuned for some more creations with this gorgeous line! I showed you the sentiment from this stamp on my last post, now this is the stamp in its entirety. Isn't it adorable? It's called Bring Your Own Sunshine. I think it's so pretty and I can see a lot of use in the future. I love the sentiment. I aim to live my life that way; to look at the positive. Even when life deals you a snowball ( you know, the hard packed one with a big rock in it?) If you can change your perspective a tiny bit and look for the positive it may ease your burdens a little. Doesn't mean the snowball might not catch you square in the chin, but if you look at the bright side, you didn't lose an eye! I stamped my image onto white cardstock and then ran it through the oval die, leaving the image in the die until I sponged pool party ink on. That's what left the fun white border. I coloured the boots with Copic Marker and added a slash of white gel pen as a highlight. Lastly, I added some fine raindrops by using my glue pen and some glitter!!! I assembled my card and added the little flowers!!! IT did make me smile however; a good indication that summer's on its way!!! 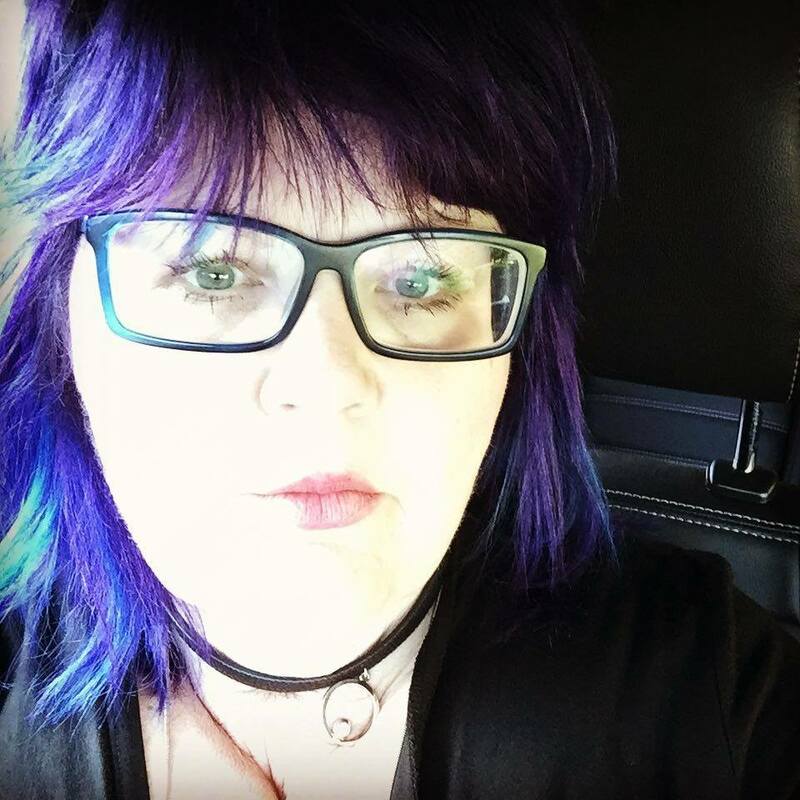 I hope you have a MOST amazing day! Are you all ready for the weekend? Hoping that the weather is better so that we can really confirm that Spring has sprung! Mitra has released some new dies over at Impression Obsession. I used these Scribble Circles to create this abstract snowman. I used the hat from the Snowman set. I trimmed the bottom of the hat to follow the line of the smallest scribble circle. In behind, I created a snowy background using the grunge wash stamp. Yep, that's the same background that I used on my coffee card yesterday. Finally I stamped the Christmas Comes Anew stamp in black to balance out the hat! Last, but certainly not least =, I added some sparkles with Cosmic Twinkles. Sunny Bunnies and Sunny Bunnies Dies. Aren't they too stinkin' cute? 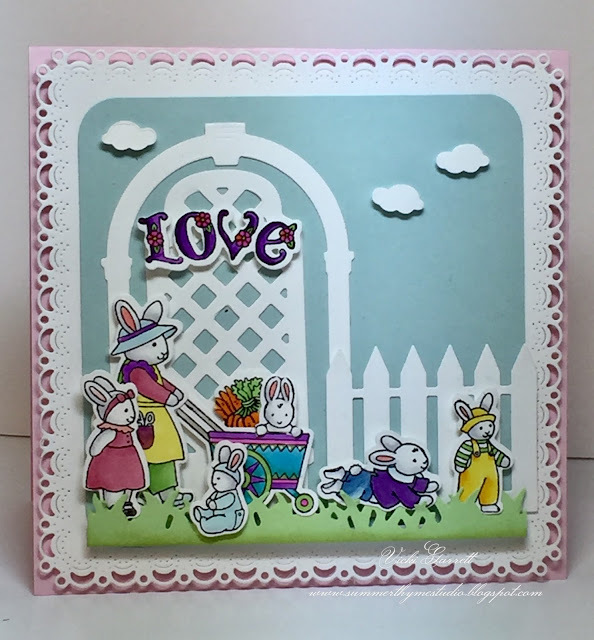 I love that they are petite sized stamps and dies so that you can add a whole family to your card! I just coloured up the sweet momma and her babies with Copics and Touch Markers and then used some additional dies to create the scene.